During the great H5N1 diaspora of 2006, we saw highly pathogenic H5N1 go from being a geographically limited threat to a global problem when, in a little over a year’s time, it spread from 15 southeast Asian nations to much of Western Europe and into parts of west Africa. By the end of 2007, more than 60 nations had reported this avian flu virus either in poultry or wild birds. But for reasons not well understood, this virus halted its global expansion. H5N1 activity began to ebb in 2008, and while it remained endemic in a handful of countries like Vietnam, Bangladesh, India, Indonesia, Egypt, and China, its decline through 2013 was dramatic. Last year, the avian flu tide began to turn. Again. 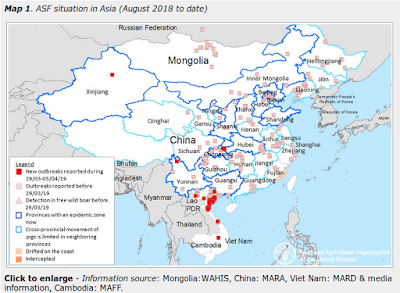 Partly because HPAI H5 was joined by H7N9 (in 2013) and a growing list of HPAI H5 reassortant viruses (H5N2, H5N3, H5N6, H5N8), and partly because the venerable H5N1 virus was on the move again. Egypt, which only reported 4 human infections in all of 2013, suddenly found itself in the midst of the worst H5N1 outbreak in history starting last November. Although reporting from the Egyptian MOH has been sketchy, since then we are aware of at least 160 human cases, and nearly 50 deaths. While the `big bird flu’ story has been the global spread of H5N8 and its reassortants into Europe and North America, and the havoc it has caused in the poultry sector, the H5N1 virus has also been turning up in countries that haven’t reported it in years. Most notably Eastern Europe and West Africa. While the number of African nations reporting H5N1 remains relatively low, surveillance in most of these countries is – to put it generously - suboptimal, and in some cases nonexistent. How widespread H5N1 really is in Africa is anyone’s guess. And in a few months, millions of migratory birds will return once more to west-central Africa to overwinter. If you look at a map of the migratory bird flyways (see below), you see that West Africa sits at the southern intersection of no fewer than three migratory flyways. Routes that begin in the northern climes of Russia, Mongolia, and China where H5N1 is known to circulate in wild birds – and that cross both Europe and the Middle East. Today the FAO has announced an appeal for additional funding to help prevent the further spread of bird flu in Africa, warning that it has the potential to spread widely and potentially jump to humans, as well as destroy their poultry industry. First, we’ve a short (3 minute) audio interview with the FAO’s Chief Veterinary Officer in Rome Dr. Juan Lubroth. Next, a press release from the FAO Newsroom. 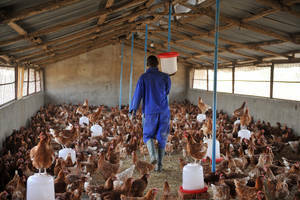 A poultry farm in Chad, one of the countries at risk following a recent bird flu outbreak in neighboring Nigeria. 20 July 2015, Rome – Fears are growing that without timely intervention to stem outbreaks of the highly virulent avian flu virus H5N1 across West Africa, further spread across the region and beyond is inevitable, FAO said today. To this end, the agency is calling for $20 million for prevention and response activities. The call follows outbreaks of the virus in poultry farms, markets and family holdings in Nigeria, Burkina Faso, Niger, Cote d’Ivoire and Ghana. The outbreak comes as countries across West Africa are still recovering from, and in some cases still battling, Ebola. Avian flu could trigger a mass die-off of chicken – a nutritious and inexpensive source of food for many people– with detrimental impacts on diets and on the economy of the region, exacerbating an already difficult situation. Previous strains of the virus - known to be highly virulent to poultry and capable of causing illness and fatalities in humans – have been circulating in Asia since the early 2000s and in Egypt for almost 10 years. The H5N1 strain has caused the death of tens of millions of poultry and losses of tens of billions of dollars. While the first incursion of the H5N1 in West Africa occurred in 2006 it was eliminated by 2008. In late 2014, however, the virus was re-introduced in Nigeria, where it spread rapidly in the following three months - to date more than 1.6 million birds have been culled or have died from the virus. Because the disease can be transmitted to humans and is considered highly lethal, FAO is working closely with the World Health Organization on country assessments, contingency plans, offering technical assistance and investigating potential flu cases and the source of infection. “Based on what we do know, there is a real risk of further virus spread. Urgent action is needed to strengthen veterinary investigation and reporting systems in the region and tackle the disease at the root, before there is a spillover to humans,” said Juan Lubroth, Chief of FAO’s Animal Health Service Division. FAO’s appeal for $20 million for prevention and response foresees bolstering weak veterinary systems, improving the capabilities of local laboratories and putting FAO specialists on the ground in affected and at-risk countries.